Natural gas is a significant component of the US energy economy, but in order for its potential to be realized in the transportation sector, the challenges of on-board natural gas storage need to be addressed. Natural gas liquefaction is an energy-intensive and expensive cryogenic process, and attaining viable energy densities by compressing natural gas necessitates high pressures that may be hazardous. On-board storage therefore requires highly specialized tanks. Inexpensive, carbon-based materials that can store natural gas by physisorption offer the possibility of increased storage capacity at lower pressures, and therefore are a major subject of current research. Physisorption occurs when an adsorbent induces gas molecules to form a locally densified layer at its surface due to physical interactions. This increases gas storage over pure compression and its efficacy is dependent on the surface area of the adsorbent and the isosteric heat of adsorption. 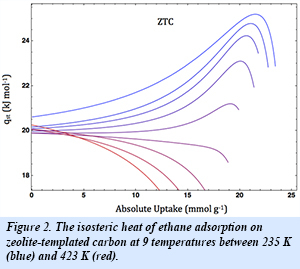 The isosteric heat of adsorption is the molar change in gas enthalpy upon adsorption and serves as a measure of adsorbent-adsorbate binding strength. Using zeolite NaY as a template, the EFree group at Caltech, including EFree member Brent Fultz and graduate student Max Murialdo, have synthesized and tested a nanostructured, zeolite-templated carbon material with an extremely large surface area in excess of 3500 m2g-1 and favorably anomalous isosteric heats of adsorption for both methane [N. Stadie et al., J. Am. Chem. Soc. 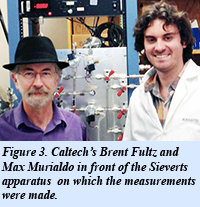 135, 990-993 (2013)] and ethane [M. Murialdo et al., J. Phys. Chem. C 119, 944-950 (2015)], the two main components of natural gas. 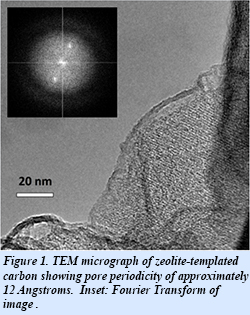 The unique structure and uniform pore periodicity of the as-synthesized zeolite-templated carbon (Fig. 1) promotes lateral interactions among the adsorbed molecules that cause the isosteric heat of both methane and ethane adsorption to increase with loading. This anomalous and previously unknown effect (Fig. 2) is in contrast to the conventional behavior of the isosteric heat, which typically decreases with loading due to surface heterogeneity. Through additional work the group has further characterized these cooperative effects and developed simple models to understand this behavior in a variety of gas systems. The current zeolite-templated carbon allows for a 50% improvement in deliverable methane capacity over pure compression (cycled between 3 and 90 bar at 298 K). Further work in this area is focused on developing an understanding of this effect so that the adsorbent nanostructure may be tuned to improve the physisorption properties of the material and provide information for the development of materials with increased adsorption efficiencies.